It doesn't really matter where you stay in Devon because the coast and beach are never very far away. Even if you're in the depths of the countryside, a beach will be within a short drive. Surfing is a popular sport on the windswept beaches of north Devon. You will also see children flying kites. The coastal paths are wonderful for pleasant strolls taking in glorious countryside and sea views. Take your camera for amazing photographs to look back on in years to come. Birdwatching. There are several nature reserves on or near the coast. Teach the children to recognise a few birds and enjoy nature. Boat trips. Hire a boat or take a pleasure cruise along the Devon Coast. Fishing and crabbing. 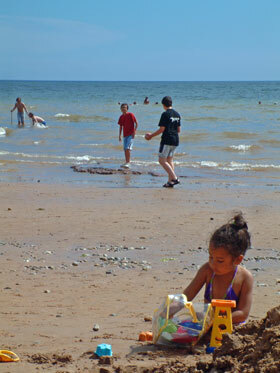 Children always enjoy a spot of crabbing or generally looking for small creatures in rock pools. There is a great choice of sea or coastal fishing. A round of golf on a Devon links course. Take time out and explore the delights of hitting a golf ball around a links course in Devon.